Over the years most clinics apply 300 IU/kg dose heparin regimen which has been empirically advanced and universally accepted for CPB to reach target ACT values, but this regimen sometimes can lead to higher ACT values. (13) This situation may cause to more postoperative bleeding, more postoperative blood transfusion and prolonged intensive care staying, although heparin is antagonized with protamine at the end of CPB. In this study we would like to compare retrospectively patients under went open heart surgery whom ACT’s during CPB were 400-650 seconds with the patients whom ACT’s were 650 seconds and higher during CPB. 192 patients underwent CPB over age 18, between October 2014 and May 2014 retrospectively evaluated in our clinic to investigate a comparison of high and low ACT levels patient groups and their postoperative bleeding and related complications. In this study, Hospital operating system and archives were browsed, perfusion notes and intensive care unit notes were scanned, patient weight, operation made, body surface area, CPB time, aortic cross clamp time, gender, age, maximum ACT time during CPB, heparin dose managed, blood transfusion amount, postoperative first day drainage and intensive care duration has recorded. Patients whom anticoagulation had started with 200 IU/kg heparin dose regimen with ACT range between 400 and 650 seconds during CPB represented as group I and 50 IU/kg additional heparin dose had been applied when ACT during CPB recorded below 400 seconds. Patients whom anticoagulation had started with 300 IU/kg heparin dose regimen with ACT range 650 seconds and higher during CPB represented as group II. Those two groups compared for postoperative first day drainage, postoperative blood transfusion amount and intensive care unit staying. No significant difference were found between two groups regarding ages (p=0,126), weights (p=0,526), body surface areas (p=0,762), CPB durations (p=0,415), aortic cross clamp times (p=0,387) are compared. There is statistical relevance between two groups for postoperative first day drainage (p=0,000), postoperative blood transfusion amount (p=0,010) and intensive care duration (p=0,0015) which favor for the group whom ACT range during CPB is 400-650 seconds. In another study of 100 patients who were perioperatively heparinized at a dose of 300 IU/kg and 145 patients who started heparinization at a dose of 145 IU/kg with a minimum target of 300 seconds, followed with close ACT monitorization perioperatively and patients applied ­additional dose of heparin under target ACT. Low dose heparin patients had less blood transfusions and had less postoperative drainage. (16) In this study, we compared two groups of patients(22) whom underwent open heart surgery with CPB and perioperatively close ACT monitored. Group I had anticoagulation started with 200IU/kg heparin dose and additional 50IU/kg heparin administered below the target 400 seconds ACT and perioperative maximum of 650 seconds ACT. Group II had started anticoagulation with 300 IU/kg dose heparin whom ACT counted above 650 seconds perioperatively during CPB. Between those two groups, there were no significant difference for age, for weight, for aortic cross clamp time, body surface area and CPB time. Patients during CPB with ACT range between 400 and 650 seconds favors for less postoperative first day drainage, postoperative blood transfusion and intensive care unit staying. Please Cite this article as: Özkan B., Özkan G., Oto Ö. Comparison of Short and Prolonged ACT Groups During Cardiopulmonary Bypass about Postoperative Drainage and Blood Transfusion. EJCM 2018; 06 (3): 113-115. Doi: 10.15511/ejcm.18.00303. Bigelow WG, Callaghan JC, Hopps JA: General hypothermia for experimental intracardiac surgery. Ann Surg. 132:531 1950. Kirklin JW: Open-heart surgery at the Mayo Clinic. The 25th anniversary. Mayo Clin Proc. 55:339 1980 6990115. Boyle EM Jr, Pohlman TH, Johnson MC, Verrier ED: Endothelial cell injury in cardiovascular surgery: the systemic inflammatory response. Ann Thorac Surg. 63:2771997. 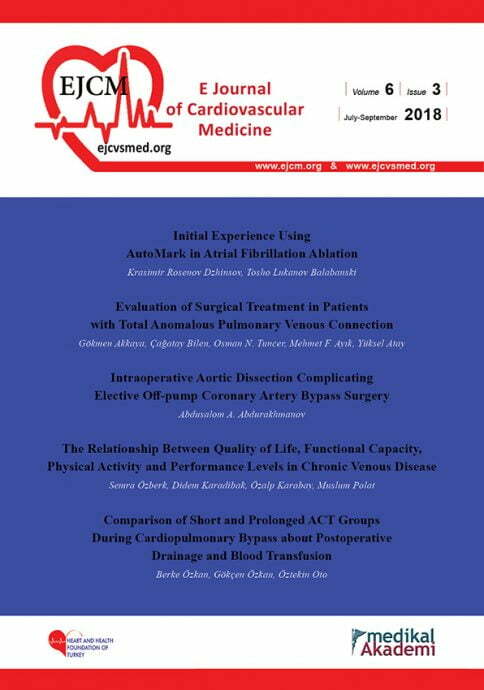 Coronary artery bypass surgery with heparin-coated perfusion circuits and low-dose heparinization John C. Mullen, Michael J. Bentley, BSc (MLS); Elliot T. Gelfand, Arvind Koshal, Dennis L. Modry, Craig R. Guenther, Wai S. Etches, Linda J. Stang, MLT Steven R. Lopushinsky. Dunn J, Kirsh MM, Harness J, Carroll M, Straker J, Sloan H: Hemodynamic, metabolic, and hematologic effects of pulsatile cardiopulmonary bypass. J Thorac Cardiovasc Surg. Hattersley PG. Activated coagulation time of whole blood. Jama. 1966 May 2;196(5):436. Hattersley PG. Activated coagulation time as screening test. Jama. 1972 Oct 30;222(5):583-4. Hattersley PG. Progress report: the activated coagulation time of whole blood (ACT). Am J Clin Pathol. 1976 Nov;66(5):899-904. Hattersley PG. A semiautomated instrument for the activated coagulation time (ACT). Am J Clin Pathol. 1980 Feb;73(2):293. Reich DL, Zahl K, Perucho MH, Thys DM. An evaluation of two activated clotting time monitors during cardiac surgery. J Clin Monit. 1992;8(1):33-6. Lobato RL, Despotis GJ, Levy JH, Shore LJ, Carlson MO, BennettGuerreroE: Anticoagulation management during cardiopulmonary bypass: a survey of 54 North American institutions. J Thorac Cardiovasc Surg. Anesthesia & Analgesia: October 2010 – Volume 111 – Issue 4 – p 833–835 doi: 10.1213/ANE.0b013e3181f08a80 Activated Clotting Times, Heparin Responses, and Antithrombin: Have We Been Wrong All These Years? Levy, Jerrold H. MD, FAHA; Sniecinski, Roman M.
Doty DB, Knot HW, Hoyt JI, Koepke JA. Heparin dose for accurate anticoagulation in cardiac surgery. J Cardiovasc Surg 1979;20: 597–604. Shuhaibar MN, Hargrove M, Millat MH, O’Donnell A, Aherne T: How much heparin do we really need to go on pump?A rethink of current practices: European Journal of Cardio-thoracic Surgery 2004: 947–950. Verska JJ. Control of heparinization by activated clotting time during bypass with improved postoperative hemostasis. Ann Thorac Surg 1977;24:170-3. Hill JD. Dontigny L. de Leval M. et al. A simple method of heparin management during prolonged extracorporeal circulation. Ann Thorac Surg 1974;17:129-34. Babka R, Colby C. E1-Etr A, et al. Monitoring of intra-arterial heparinization and blood 10ss following cardiopuimonary bypass surgery. Bull BS, Huse WM, Brauer FS, et al. Heparin therapy during extracorporeal circulation: II. J THORAC CARDIOVASC SURG 1975;69:685-9. Esposito RA, Culliford AT, Colvin SB, Thomas S J, Lackner H. Spencer FC. Heparin resistance during cardiopulmonary bypass: the role of heparin pretreatment. J THORAC CARDIOVASC SURG 1983;85:346-53. Kouchoukos NT, Blackstone EH, Hanley FL, Kirklin CK: Cardiac Surgery. 2012; fourth edition: volüme 1; 105-106. Aki BF, Vargas GM. Neal J, Robillard J, Kelly P. Clinical experience with the activated clotting time for the control of heparin and protamine therapy during cardiopulmonary bypass. J THORAC CARDIOVASC SURG 1980;79:97-102. Reser D., Kolbe M., Pomar JL., Maisano F., Taramasso M. How to make a “Heart Team” a “real” Team to ensure optimal patient care. EJCM 2018; 06 (2): 32-35. Doi: 10.15511/ejcm.18.00232.